The earliest printed edition of a dice game is Johann Philipp Kirnberger's "Der allezeit fertige Menuetten- und Polonaisencomponist" (The ever-ready minuet and polonaise composer") (1757) (Reuter, 2014). Kirnberger was a German composer, conductor, and music theorist. He played the harpsichord and the violin, and he was a student of Johann Sebastian Bach in Leipzig. In the period 1741-'50, he held various music teaching and director appointments in Poland and in 1758 he became composition teacher and conductor to Princess Anna Amalia of Prussia. In his life he wrote several books on music theory of which his most important work is Die Kunst des Reinen Satzes (The art of pure movement) (1771-79). He also developed tempered tunings which received his name and he invented an harmonic approach that provided instructions for mechanical music production. In 1757 he wrote the manuscript "Unzählbare Menge von Polonoisen, Menuetten und dazugehörigen Trios" (innumerable multitude of Polonaises, Minuets and related Trios) which laid a foundation for musical games with the help of dice. Perhaps one can state that with that manuscript he was a precursor of computer programs which promise to generate sophisticated musical works (Gedan, 2009). Kirnberger himself states that he took the idea, be it imperfect, from others. Perhaps he found inspiration in book VIII (Liber mirificus) of "Musurgia ..." published by the scholar Athanasius Kircher (1601-1680). Kircher stated that musical inspiration for composing is no longer necessary, a skillful manipulation of numbers would be sufficient. He even described a 'composing machine'. (Of course Kircher was not only influenced by the philosophy of rationalism; for him, mathematics is underlying all being, and describing God's order through mathematics is an axiom.) (Kupper, 1995). Our implementation of Kirnberger's dice game is based on the 1767 edition of his work. From the prefabricated measures by Kirnberger we only used those for minuets and trios, and as such lacks the polonaises. The original, written for two violins and cembalo, was transcribed for piano by Suus van Petegem. Perhaps in order to disguise the inner working of the dice games he mixed all the measures and devised lookup tables used to create new piece. His followers, a.o. Stadler and Mozart, have gratefully adopted this principle. The minuet by Kirnberger has two parts of eight measures with six alternatives each (i.e. the number of different sums you can get by tossing one die). The trio also contains two parts, each with eight measures embodying six alternatives. So, in total, Kirnberger wrote 96 + 96 = 192 measures for this musical dice game (see: "Measures"). The harmonic structure for the first 8-measure section of the minuet generally follows the pattern: D..A7 / D.A7.D / A7..D / A..D / D / E7 / A..E7 / A7/; for the second section, the structure is: B7 / Em.B7.Em / A7 / D.A7.D / G / A7 / D..A7 / D/. In the trio, the first 8-measure section follows the pattern D / A / A..A7 / D / D / Gm / F.C.. / F/; the second Dm / G7 / C7 / F / Dm / A7 / Dm.A7.. / Dm/. Gedan, J. (2009), Johann Philipp Kirnberger: Der allezeit fertige Polonoisen- und Menuettencomponist, Edition Pian e forte (www.pian-e-forte.de). 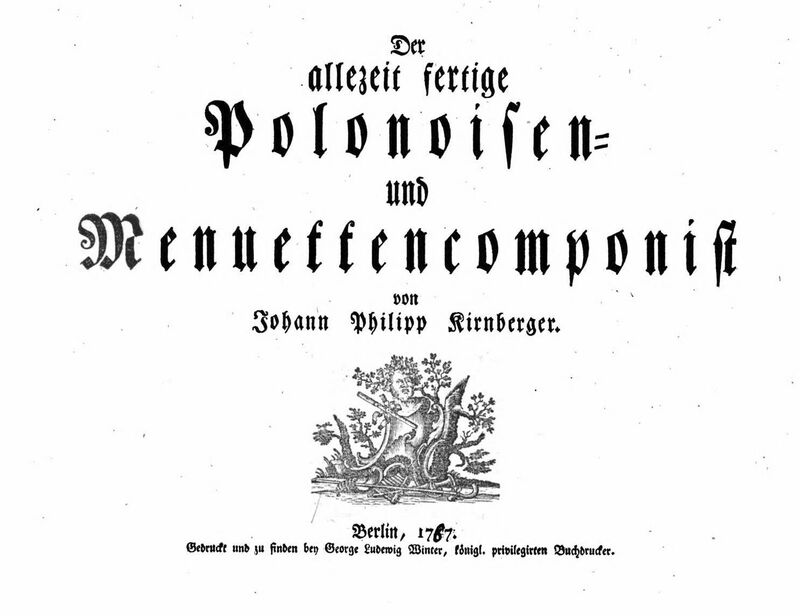 Kirnberger, Johann Philipp (1767), Der allezeit fertige Menuetten- und Polonoisen-componist, Berlin, Winter, 30 pp. Kircher, Athanasius (1650), Musurgia Universalis Sive Ars Magna consoni et Dissoni in X libros digestos, book VIII: Liber mirificus, Roma. Kupper, Hubert, Der allezeit fertige Polonoisen- und Menuettencomponist, Musikinformatik & Medientechnik, Nr. 15, Mainz, 1995.